Our Future Rooted in Our Past: Do You Have A Notable Women Ancestor? Do You Have A Notable Women Ancestor? If you have worked on your family history, I am sure that you have discovered that the females in your family tree can be very illusive and difficult to locate. This is in part due to the worlds view of women in the past and to some extent in the present. Many women in the past were not allowed to own property or if they did, the property became their husband's property upon marriage. Records of women property holders are scarce, the husband's surname is taken by the woman upon marriage, and it was not until 1850 US census that the names of each individual in a family group were recorded. 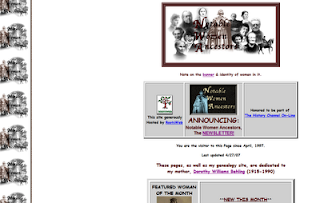 The author of Notable Women Ancestors Website by Susanne "Sam" Behling has developed a site honoring women in the past. The site easily navigated by using the alpha browse capability located on the front page. Women whose biographies and pictures are located on this site are also available for searching by various titles that they might have been identified with in life such as: Adventurer, African Americans, Artists, Authors, Educators, Entertainers, Feisty Women, Firsts, Great Mothers, Aunts, Sisters & Grandmas, Health Care/Humanitarian, Heroines, Humorous, Native Americans, Notorious, Pioneers & Emigrants, Politicians, Political Wives & Suffragists, Religious Leaders, Royalty, Survivors, and Witches. Susanne Behling said that if you find that you do not have an ancestor on this site, you only need to submit a biography to her and she will post it for you. If you would like to search for your Notable Female Ancestors, you might want to check out Notable Women Ancestors.